Summer cooking is mostly simple and fast. My husband says he’s starving and putters in the garden for half an hour. Meanwhile, I can make an entire lunch, including soup from scratch. Nothing beats freshness, especially when it seems more complex with a few simple tricks. My trick in this case is having vegetable broth on hand, corn broth made from a dozen stripped cobs after I made a fourth of July picnic salad, and trimmings of celery, onions and carrots. 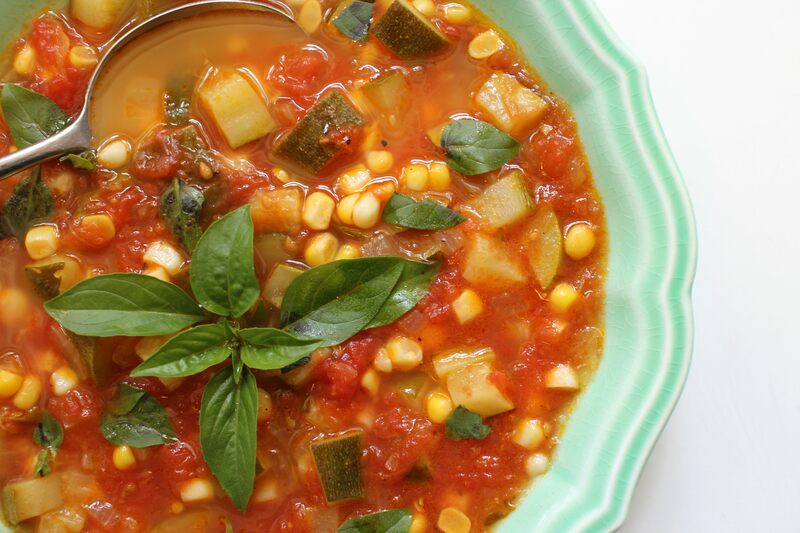 The broth, along with leftover homemade tomato puree, was poured over chopped onion, diced zucchini, and corn kernels and simmered for 20 minutes. 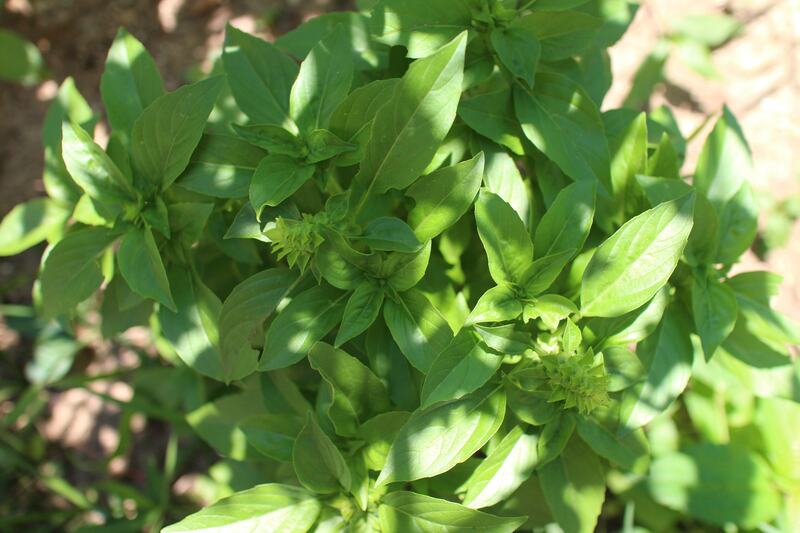 It was simply seasoned with fresh basil from my garden, a variety called “Floral Spires White,” which like “Fino Verde,” stays relatively small-leafed and is therefore ideal for garnish. Floral Spires, compact like some of the Thai basils, comes in lavender and white, and is more ornamental than most varieties without losing any of its value as an herb. I am growing mine in the ground this year but it makes a great potted plant. In a saucepan over medium heat, cook the onion in olive oil until translucent. If using fresh tomatoes, add them to the onions and cook for about 7 minutes until they have softened and collapsed. (If using tomato sauce, add it with the broth.) Add the zucchini and corn and stir well. Add the broth and bring the mixture to a simmer. Cook until the zucchini is soft but not mushy, about 10-15 minutes. Season with salt and pepper, and garnish with fresh basil.